A novel mission concept involving two CubeSats connected by a thin, miles-long tether could help scientists understand how the Moon got its mysterious "tattoos" -- swirling patterns of light and dark found at more than 100 locations across the lunar surface. NASA's Planetary Science Deep Space SmallSat Studies, or PSDS3, program recently selected a team at the Goddard Space Flight Center in Greenbelt, Maryland, to further develop a mission concept called the Bi-sat Observations of the Lunar Atmosphere above Swirls, or BOLAS. The study, led by Goddard Principal Investigator Timothy Stubbs, could lead to the first tethered planetary CubeSat mission, Stubbs said. "This is an exciting concept," said Michael Collier, a BOLAS co-investigator who has studied tether-based missions for gathering difficult-to-obtain lunar measurements since 2015. "Candidly, I think it's groundbreaking. Tethered satellites are a very natural approach for targeting lunar science." As currently conceived, the mission would involve two 12-unit CubeSats, whose individual units would measure just four inches on a side. Once the pair reached a low-maintenance, quasi-stable orbit about 62 miles above the Moon's surface, the two, connected by a 112-mile-long thin tether, would separate. The top satellite would climb 118 miles above the surface, while the lower, nearly identical twin would plunge to an altitude of about six miles above the surface. "The tension in the tether keeps the CubeSats in vertical alignment as they orbit," Stubbs said. "The configuration, with the center-of-mass in a quasi-stable orbit, should enable the lower CubeSat to fly for long durations at low altitudes." Without a tether system, a comparable low-altitude mission would need prohibitive amounts of fuel to maintain its orbit. NASA's Lunar Reconnaissance Orbiter, or LRO, for example, flew in a circular orbit 31 miles above the surface early in its mission. 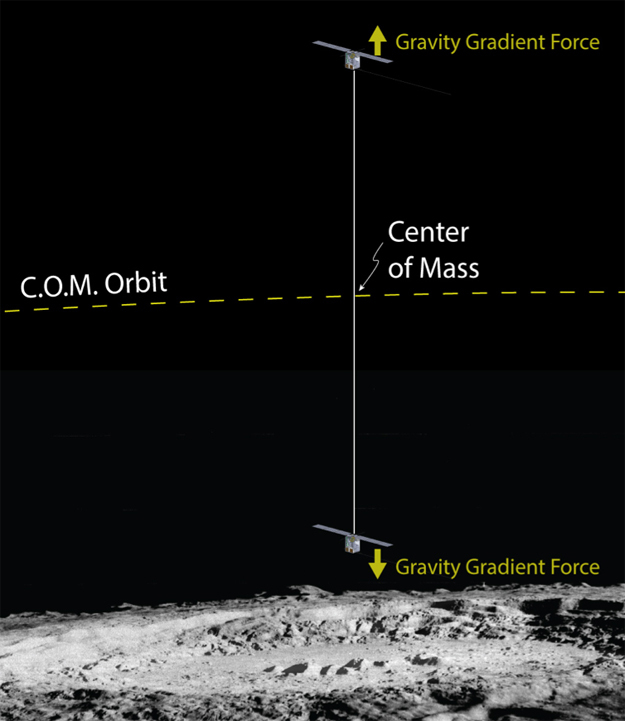 If NASA hadn't executed propulsive maneuvers to maintain this orbit, the spacecraft would have smashed into the surface. This is due to the large concentrations of mass lurking on the lunar surface. These "mascons" change the gravity field and can either pull the spacecraft or push them off course, dooming them to a mission-ending collision. "For planetary objects that lack an atmosphere, tethering is an innovative approach to the technical challenge of low-altitude measurements using minimal propellant," Collier said, adding that a CubeSat couldn't carry the amount of fuel needed to carry out periodic station-keeping maneuvers. For scientists attempting to better understand the Moon's odd, airless environment, the lower they can deploy the CubeSat, the better. Equipped with a nearly identical suite of miniaturized instruments, including spectrometers and imagers already advanced by BOLAS co-investigators and collaborators, the twin satellites would characterize the lunar hydrogen cycle from both a low and high altitude. "There is a lot of science you can do with this instrument suite," Stubbs said, adding that the team plans to leverage subsystems developed by Kentucky's Morehead State University, which is leading NASA's Lunar IceCube mission. Lunar IceCube will prospect for lunar volatiles and water during its six months in lunar orbit. During its proposed one year in orbit, the BOLAS instruments would characterize the mechanisms for hydrogen implantation on the Moon's surface as well as their dependence on the Moon's composition, regolith, local topography, plasma conditions, time of day, and magnetic fields within the crust. 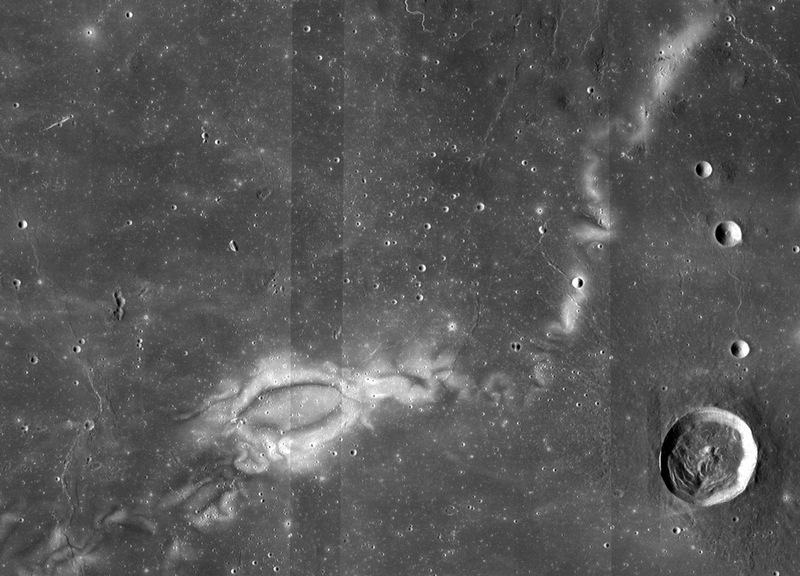 One of the mission's primary goals is understanding the formation of lunar swirls -- the odd markings of light and dark that look almost as if they were painted on the surface of the Moon -- and the role that magnetic anomalies and space weathering could play in their creation. Observations indicate that the swirls appear where ancient bits of magnetic field are embedded in the lunar crust. They also show that the bright areas appear to be less weathered than their surroundings. Several phenomena can cause material exposed to space to change both physically and chemically, resulting in darkening over time, including solar wind and micrometeoroid impacts. Those clues have led to three prominent theories about their formation. One theory suggests that the swirls and the magnetic fields both formed from plumes of material ejected by comet impacts. Another hypothesis states that when micrometeoroid bombardment lofts the Moon's fine dust particles, an existing magnetic field over the swirls sorts them according to their susceptibility to magnetism, forming light and dark patterns with different compositions. And another theory postulates that since particles in the million-mile-per-hour solar wind are electrically charged, they respond to magnetic forces. Perhaps the magnetic field shields the surface from weathering by the solar wind. Observations from NASA's LRO lend credence to the magnetic-shield hypothesis, scientists say. However, no one is ruling out anything yet. Until scientists launch a mission capable of carrying out close-to-the-ground global measurements, a definitive answer isn't likely, Collier said. However, he believes the two-satellite BOLAS mission could provide the data the scientific community needs. "This could be a paradigm shift," Collier said. "All indications show that this mission can be done with existing technology." Small satellites, including CubeSats, are playing an increasingly larger role in exploration, technology demonstration, scientific research and educational investigations at NASA, including: planetary space exploration; Earth observations; fundamental Earth and space science; and developing precursor science instruments like cutting-edge laser communications, satellite-to-satellite communications and autonomous movement capabilities. A novel mission concept involving two CubeSats connected by a thin, miles-long tether could help scientists understand how the Moon got its mysterious \"tattoos\" -- swirling patterns of light and dark found at more than 100 locations across the lunar surface.